One day In early November I was digging through my stash and found a PB & J jelly roll that had been given to me by one of the Mr.'s co-workers while trying to clear out some inventory. I took it knowing that it wasn't really my usual colour scheme but figured that I would find a use for it eventually. When I stumbled across it again in my stash, I knew that I had to turn it into a couch quilt for my Aunt. After poking around the Internet looking for pattern ideas, I found the Summer in the Park tutorial by Missouri Quilt Co. It had been on my list for a while so I decided to give it a whirl. In addition to being super fast to make, these blocks are fun! I really love the secondary diamond pattern that appears when you put the blocks together. That said, these blocks are also very versatile and could be used to make chevrons, large diamonds or lots of other shapes. I might even make another one of these at some point to try one of those out too. 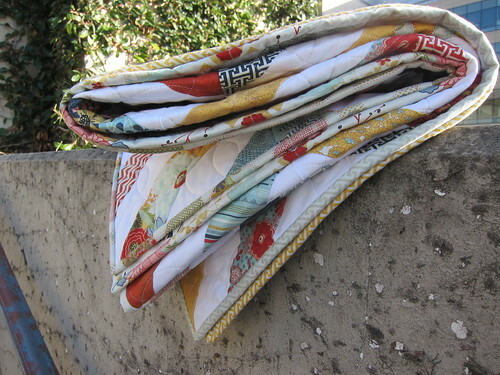 Perhaps my favourite thing about this quilt is that I was able to use every single leftover jelly roll strip for a scrappy low-volume binding, using prints that wouldn't have worked in the body of the quilt but make for a gorgeous binding. I backed it in an old Basic Grey bunting fabric I had kicking around the stash that matched perfectly and made a red bordered label so that it wouldn't get lost in the print. This is the second quilt I've sent to Lindsay to have quilted and I am once again, thrilled with the results. I like that the bubble pattern keeps things geometric and adds interest to the quilt without overwhelming the diamond shapes. Fabric: PB & J by Basic Grey jelly roll and Kona White jelly roll. 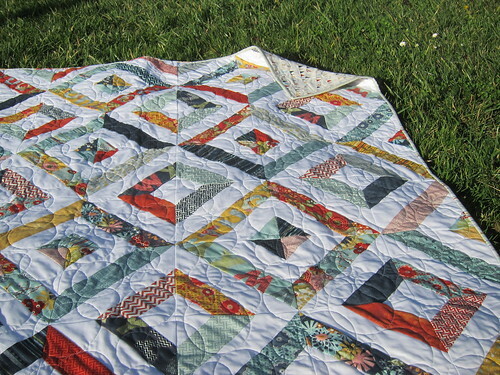 Pattern: Summer in the Park by Missouri Quilt Co. 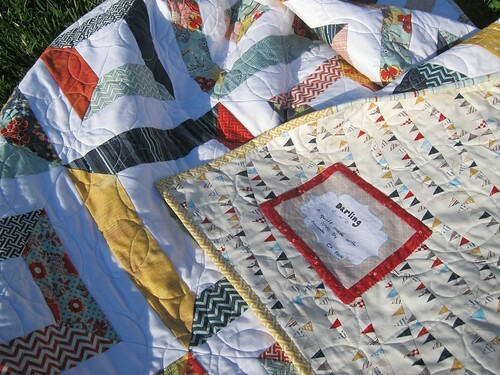 This quilt is so cozy. I'll admit that the hours I spent sewing down the binding were so enjoyable sitting under this quilt. A trip through the wash made it even softer. I can't wait to see what my aunt thinks. What a fabulous quilt! 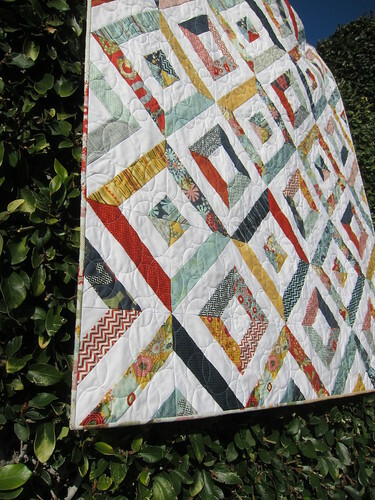 The bubble quilting is wonderful - I've never seen that pattern before and love it!! I also love your quilt label. Is it pre printed, or did you make it using three layers of fabric? The colors are so soothing. 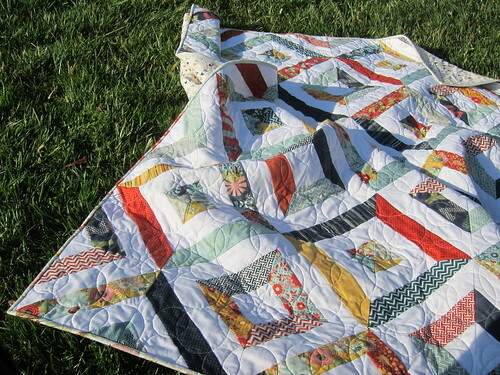 I would love to curl up with this quilt, it's truly wonderful. The quilting is so unique! Lucky Aunt!!! It looks awesome Amanda! As if i didn't already want to try that pattern enough! Definitely going to try it now. 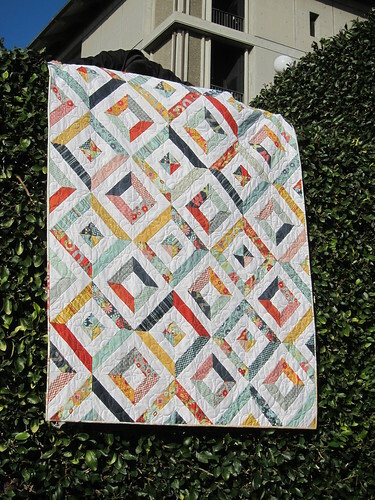 And i love the bubble quilting, perfect choice for this one! This looks amazing! What a gorgeous finish!! This is such a pretty quilt! I love the versatility of strips! This is a beautiful quilt! I'm sure your aunt will adore it. Beautiful, Amanda! I too love to use jelly roll strips for binding, I've done it several times and it feels good to use it all up! Great quilt! The fabric looks awesome in that pattern. And hooray for using the rest for the binding. I'm sure your aunt will love it! This is so pretty! Great use of the PB&J collection and the backing is perfect.